Modern design and great basic features. Get help from the Singer App or Owner's Class videos. The Simple 3337 sewing machine offers great basic features, all in a sleek, modern design! Create crafts, simple home decor, fashions and much more. Customize projects using 29 different stitches and adjustable stitch length. Make buttonholes in one easy step, whether you want to sew a dress, stitch up a pillow or create a tote. Basic accessories can be found in the removable storage compartment, including the new Sew Easy Foot which has an adjustable guide to help you guide fabric for sewing perfectly straight seams. The Top Drop-in Bobbin is easy to see so you monitor your thread supply. There is also a free arm, which makes it easy to hem trousers or other small projects like children's clothing. Not exactly sure how to get started? Sewing instruction is at your fingertips anytime and anywhere with the Online Owner's Class, and SINGER Sewing Assistant App. 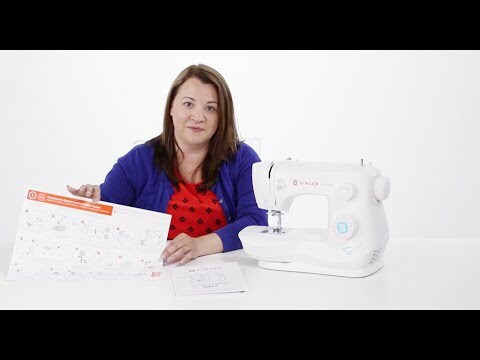 Drop and Sew™ Bobbin System - Simply place the wound bobbin into the bobbin holder, then guide the thread into the clearly marked threading path. No need to manually draw up the bobbin thread - when you start to sew, the machine will automatically pick up the bobbin thread for you, saving you time.